This page from the council presentation on the bike plan implementation update oddly includes an image of a Capitol Hill rider on perhaps the most un-pedal friendly in the neighborhood. Seattle is criss-crossed by 1,547 lane-miles of arterial streets and 2,407 miles of non-arteries. In recent years, the city has added new bike infrastructure to only about 10 miles of those streets per year. Or we live in the shittiest timeline. Experts from Liminal Seattle, trackers of all things weird, wonderful, and paranormal across Capitol Hill and beyond, tell CHS they have been unable to determine exactly what caused the late June disappearance of the mystery soda machine from E John. Breaking news from just off Broadway: The Capitol Hill mystery soda machine is gone. The King County Medical Examiner has identified a man who died in a Capitol Hill apartment where police found suspected fentanyl and cocaine Wednesday night as James Wilson. Seattle Police say the victim was also one of two men treated by medics in a double fentanyl overdose at a Capitol Hill bar in an incident reported on by CHS in late March. Call it an all-walk, a scramble intersection, or a diagonal crossing, some community members say the intersection at Broadway, John, and E Olive Way needs one. But the Seattle Department of Transportation isn’t quick to OK an intersection that would stop cars in all directions and allow all pedestrians to cross. Dongho Chang, a city traffic engineer, said those kinds of crosswalks can have unintended consequences and increase delays for everyone. But Chang said the increase in foot traffic in the last year since Capitol Hill Station opened in March does warrant additional analysis of the intersection. “We definitely want to look at how to improve conditions for them,” Chang said of the increasing number of pedestrians traveling through the intersection. A woman crossing one of the busiest intersections on Capitol Hill was struck by a driver witnesses said appeared to be rushing to make the light in a Friday noontime collision at Broadway and E Olive Way. Police were interviewing the driver at the scene. E Olive Way just west of Broadway was closed for westbound traffic for around 30 minutes during the response. Already one of the busiest Capitol Hill areas for pedestrians, the Broadway/John/E Olive way crossings have become even more active with the opening of Capitol Hill Station on the intersection’s southeast corner. Last summer, CHS reported on a study showing street and crossing dangers around the station. Late last year, intersections from Capitol Hill Station to Miller Park were selected for major pedestrian improvements though the project does not seem to include the western edge of the intersection across E Olive Way where Friday’s collision took place. Pre-WWII brick apartment buildings are part and parcel of Capitol Hill’s charm. Many also need expensive upgrades to ensure they don’t collapse in an inevitable future earthquake. As the City of Seattle continues to slowly push forward requirements for seismic retrofitting, the new owner of the 56-unit Whitworth Apartments building says he decided to get the work done before the big one hits (not to mention the likely cost-savings of doing the upgrade before a retrofitting law is passed, which will send building owners clamoring for contractors). Peter Goldman, a longtime Seattle resident, purchased the 17th and E John “unreinforced masonry” building this summer for $18.2 million, property records show. He told CHS his family had recently sold several properties out-of-state and decided to reinvest the money in two Seattle apartment buildings. The U.S. tax code encourages such reinvestments by delaying the capital gains tax. Often overshadowed by the more bustling sections of Capitol Hill, the “John and Thomas corridor” is nonetheless a crucial pedestrian and transit passageway through the neighborhood. 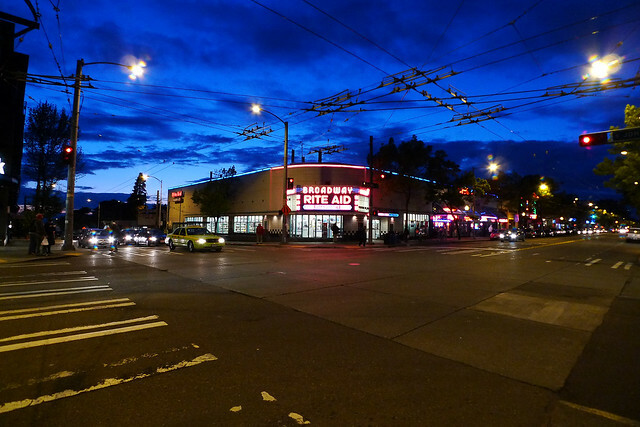 Thanks to a community-initiated proposal, 11 intersections in the corridor between Broadway and 23rd Ave are on deck for a $1 million pedestrian safety upgrade paid for by the Seattle Neighborhood Street Fund. The proposal from David Seater, a volunteer with Central Seattle Greenways, calls for installing curb bulbs along all the corridor’s un-signaled intersections. It was recently approved by the Neighborhood District Council, setting up a final vote at City Council. A doomed trio of three old houses have been demolished at the corner of 12th and John to make way for a a four-story apartment building with 51 apartment units. The houses were involved in two separate fires earlier this year likely caused by “improperly discarded smoking materials” as squatters had been using the old homes that stood boarded up awaiting their demolition to make way for the new microhousing development.